Here is the documentary proof behind the Scam of 69 Holland Road. This is the chapter in Escape from Paradise for which Helen Yeo, wife of Singapore Cabinet Minister Yeo Cheow Tong, banned the book. She did this to conceal her early recording of the property as transferred, when it was not transferred. Helen Yeo's letter to us of July 8, 2002, states, "the date of the transfer of the property was 26 December 1995." However, the Singapore IRAS Valuation List (exhibit shown below) shows that, as of 13 June 1995, 69 Holland Road, the residence of Jackie Lee Teng Jin, was already owned by Goldplus! Was this done to defraud and deceive Jackie Lee Teng Jin's wife who was divorcing him at the time and who obtained a Caveat on the property? The Singapore IRAS records would make Jackie Lee Teng Jin's wife believe that the house had already been sold when, according to Helen Yeo's letter to us, it was not. Was the "early recording" of the sale of 69 Holland road an act of fraud on the part of Rodyk? On page 3 of this letter, Helen Yeo states, "2. the date of transfer of the property is 26 Decenber 1995." Thie 13 June 1995 the property had already been transferred to Goldplus Investments Pte Ltd. In addition, is Helen Yeo banning our book out of revenge for the fact that your firm lost a lawsuit to one of the authors of our book, and that Rodyk had to pay damages? Your letter states that the date of transfer of the Holland Road property was December 26, 1995, however, the Inland Revenue Valuation List shows that, on August 28, 1995, the Holland Road property was already owned by Goldplus." How do you explain your statement, "the date of the transfer of the property was 26 December 1995?" 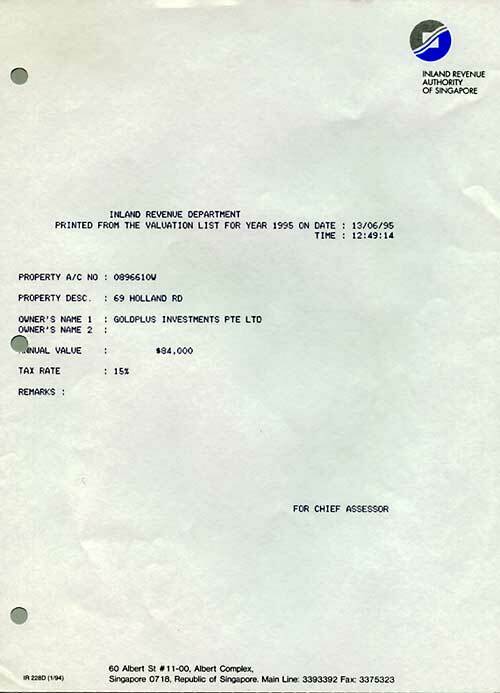 The IRAS property tax document shows that, as of 13 June 1995, 69 Holland Road had ALREADY been transferred!!! Was this "early transfer" done to enable the seller of 69 Holland Road to escape with the proceeds while involved in a divorce and with a caveat against the property? Our letter was copied to the Chief Justice of Singapore to inform him of your unwarranted and extra-legal behavior. The subject letter was not “highly defamatory” as you claim and was not calculated to embarrass your firm, nor to cause economic loss to you. Should you suffer these consequences, it is of your own doing. I object to your defamatory charge that our web-site contained defamatory materials against your firm, your lawyers and yourself. There may have been a “mischievous” (as you term it), statement about your husband. He is a political figure, and in America, we are free to comment on public figures from any nation. There were no vicious statements against your daughter; I cited only her position of privilegea fact. This is not the case, at all. I sent an email to the most important government leader, and some others. This was done to make Singapore’s leaders aware of the terrible impression you are creating for Singapore...You must learn to bear the consequences of your actions. Our book defames no one. We have over twenty boxes of documents and tape recordings (some recent) to back it up. In addition, our book was carefully vetted by several lawyers. A careful read of the chapter entitled The Scam of 69 Holland Road will show that it is very carefully worded. You are barely mentioned. The fact that Goldplus was set up by two very junior lawyers (at the time) in your firm doesn’t mean that Lee Teng Jin was a client of your firm, nor do we say it. We do not say who the Goldplus directors were working for, only that what was done was wrong. However you do admit that your firm did incorporate Goldplus Investment Pte Ltd. Whether or not you knew it or consented to it, the fact that your firm incorporated Goldplus, plus the fact that your lawyers were the original shareholders of Goldplus attaches to Goldplus the prestige of your firm’s reputation. This is all that was said in the book. We do not know, nor do we claim that you were involved in this matter.